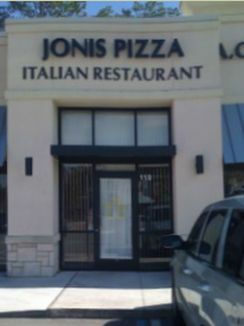 Welcome to jonispizza.com! Home of the freshest Italian in northeast Florida and beyond! Located at 1 mile south of SR 210 on US1 at The Shoppes of Saint Johns Oaks. Call us at (904) 810-0702. Our friendly staff would like to welcome you to visit ... dine in or carry out ... delivery available in some areas with a $30 minimum. For those who have yet to visit our Italian restaurant, we are very confident that once you do ... our restaurant will be your one stop favorite for the freshest, tastiest Italian cuisine! jacksonville, italian, food, pizza, ponte vedra, saint augustine, palencia, calzone, pasta, veal, chicken, wine Jonis Pizza Italian Restaurant is home of the freshest homemade italian cuisine, pizza, pasta. Located in Ponte Vedra just north of Palencia.